Angela Mombourquette (@angmombo) teaches journalism at the University of King's College, in Halifax. The sky threatens snow as a steady stream of cars bounces across the railroad tracks to a dismal parking lot on the Dartmouth waterfront. Warm in their vehicles, drivers gaze up at the suspension bridge spanning the Halifax harbour—and the great gaping hole where the road used to be. It’s 10 a.m. on a frigid January morning, and dozens have come for some Saturday-morning sightseeing. Al and Rosemarie Masters are idling their blue Chevrolet Equinox on the street just above the tracks, marvelling at a twenty-by-twenty-metre chunk of the Angus L. Macdonald Bridge—the Old Bridge, as it is known—dangling in mid-air. A gantry, positioned above the deck, is lowering a 120-tonne slab of pavement and steel by four cables to a barge waiting below. “To be able to take a piece out and put one back in that’s exactly the right size, in exactly the right place,” says Al with childlike wonder, “it’s unbelievable.” The retired pair, both in their seventies, drove more than 200 kilometres from their home in Antigonish, Nova Scotia, to visit relatives and explore the big city for the weekend. But with bellies full of motel breakfast, they’re parked here, watching to see what happens next. For only the second time in history, the deck of a suspension bridge has been replaced while remaining open to traffic. It’s not surprising that the Big Lift, as this $207 million project is called, brings out sightseers with a soft spot for engineering. Over the course of a year and a half, forty-six segments of the 1.3-kilometre-long bridge will be cut by diamond-tipped saw and thermal lance, lowered to a barge or hauled off by truck, and replaced with new prefabricated sections that fit together like Meccano pieces. Slated for completion in the fall of 2017, the rejuvenation project will extend the bridge’s life by seventy-five years. The image of the green girders and orange suspender cables across the harbour has come to define the cityscape. But the Macdonald is more than just an iconic landmark. Five men died during its construction sixty years ago after falling from catwalks. Barriers were added to the pedestrian walkway in 2009 because of an untold number of suicides. The first baby born on the bridge came into the world in the front seat of a car just past the toll booths on a chilly February morning in 1985. Rosemarie thinks back to the day the bridge opened on April 2, 1955, when she was nine years old. “I remember the excitement that you could walk over it. It was a big deal,” she says. Until then, the most direct route between Dartmouth and Halifax had been a steam-powered ferry (which had itself replaced a horse-powered boat). 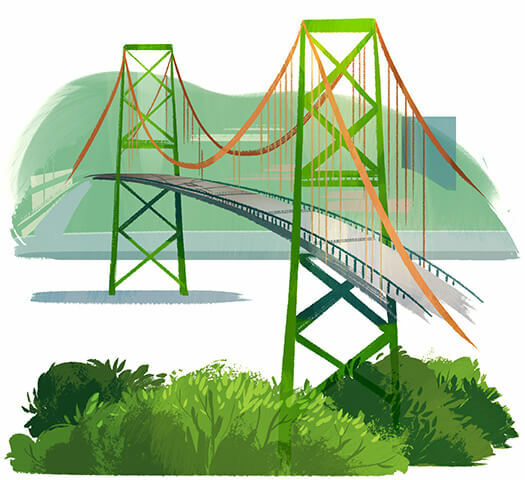 This bridge—and later, the A. Murray MacKay Bridge, which opened in 1970—accelerated Dartmouth’s growth into a bustling commercial centre and an affordable community. The past decade has seen an influx of hip young families and offbeat independent businesses bring new life to Dartmouth’s once-gritty downtown core. It’s only the second time in the world—the first being the rebuild of Vancouver’s Lions Gate Bridge in 2000 and 2001—that the deck of a suspension bridge has been replaced while remaining open. The work is being done overnight and on weekends to keep traffic flowing during weekdays. And when the first segment of the Macdonald came out on a brisk, sunny morning last October, clusters of spectators gathered along the rocky shoreline, snapping photos and posting images to social media. Things didn’t go quite as planned that weekend. A problem connecting old and new segments meant the bridge was still closed when rush hour arrived on Monday morning. Traffic was snarled, and frustrated commuters were delayed for hours. When cars were finally allowed to cross, they had to slow to a crawl to avoid bottoming out on a nine-centimetre bump where a thick steel plate spanned a gap of nearly two metres between old and new deck segments. In carpools and coffee shops, grumbling about the bump became a local pastime. Everyone in these two cities—which, since 1996, have been a single municipality that includes a number of other suburbs—has a connection to this bridge. Approximately 48,000 vehicles cross the bridge every day; so do 700 cyclists and 750 pedestrians—or did, until last summer, when the galvanized bike and pedestrian lanes were removed and repurposed as bridges on hiking and snowmobiling trails throughout the province. On the frigid January morning, Rosemarie and Al—who celebrated their fiftieth anniversary last October—watch from the comfort of their warm car as workers prepare to raise a new section into place, awestruck by the scale of this project. In the 1970s, Al worked as a technician for the phone company, Maritime Tel & Tel Limited, testing the cable that ran beneath the bridge. That meant climbing over the railing and working fifty-four metres above the surface of the water, with scant safety gear. But Al chuckles at the real reason he and his wife have been drawn here to reminisce under the bridge. When he was courting Rosemarie, she lived in Dartmouth, and he in Spryfield—a community just off the Halifax peninsula. “I used to walk across it a lot late at night,” he says. This appeared in the July/August 2016 issue. Irma Kniivila is an illustrator and artist who has recently completed projects for Marvel and Boom! Studio's Joyride.